A christening is where the parents and their family introduce their beloved new arrival into the world and it is day full of celebration and joy. When you are in doubt, remember that it is a good idea to buy a shoe that is darker in colour than the actual outfit. When your precious infant is going to be christened it is always important to remember that it is the shoes which complete the outfit. Sometimes parents will spend a great deal of money on an exquisite outfit and then settle for just any pair of matching shoes, but of course this will not do the outfit any justice. When choosing your christening outfit, always select the clothes first. The shoes need to compliment the outfit and not look odd because they are the wrong colour or style. If your little girl for instance is in a dress covered in ruffles and ribbons, you might think it important to get matching shoes with frills and ribbons too. But you need to consider the fact that this might be overkill and that nobody notices the outfit so much because the shoes are screaming out for all to look at them. Christening shoes need to complement the outfit, not detract from the outfit. 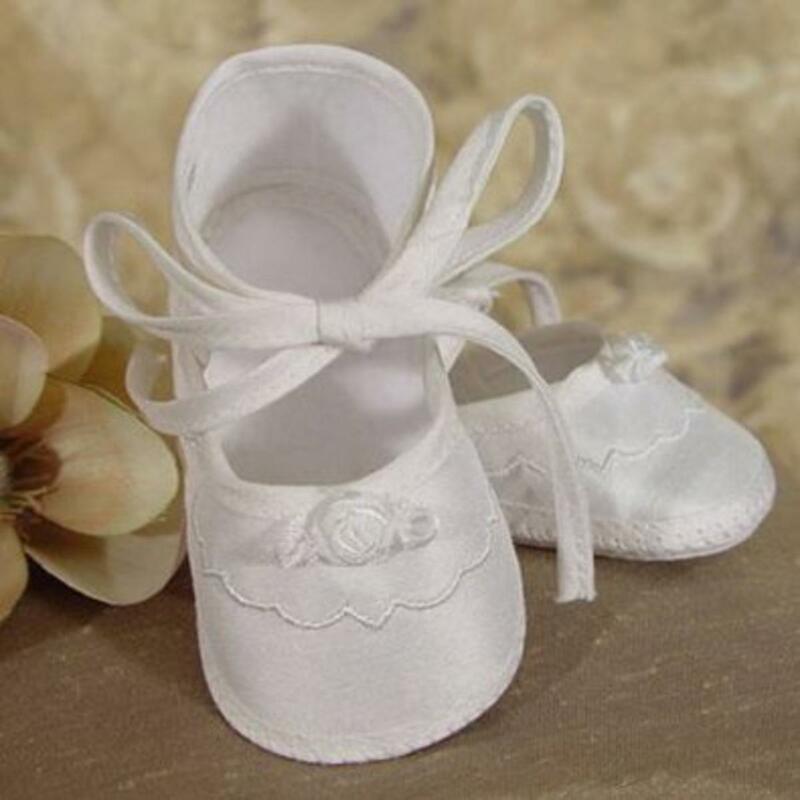 Baby christening shoes will often tend to come in a variety of white colours; the shoes could be cream, ivory, snow white or off-white. Believe it or not, the colour white does come in many different shades that it can be quite hard to match between the outfit and the shoes. When you are in doubt, remember that it is a good idea to buy a shoe that is darker in colour than the actual outfit. The reason is that if you put white and cream next to each other, the total effect can make the cream colour look a bit grubby next to the radiant white colour, and you do not want your baby's outfit appearing anything close to grubby. When looking for beautiful christening shoes for either boys or girls, your best bet would be to look on the internet. You will find a variety of different styles and colours available that you can order online and have delivered. Fortunately the descriptions on the internet are well detailed, usually accompanied by close up pictures of the shoes so you know exactly what you are buying. Girls christening shoes are made from 100% cotton batiste accented by delicate tiny braids and ribbon rosettes. Usually a faux button closure hides the Velcro tab. Another girl's shoe choice is one made from 100% silk dupioni, usually embroidered delicately over the toes, including matching ribbon rosettes with bias tie closures. Baby boys' shoes are usually made from 100% polyester matte satin, often with Celtic cross embroidery embroidered on the sole of the shoe and also over the toes. Not only are these exquisite baby shoes trendy, but they are able to be wiped clean, using a dry sponge. This keeps them shimmering white and beautiful for babies from about three to twelve months. Any gorgeous shoes matching the just-as-gorgeous outfit needs to be fashionable and comfortable, needing only to be put on and taken off easily. Remember that it is easier to match christening shoes to baby's outfit than it is to match the outfit to the shoes. There are some people who think it silly and even futile to spend a lot of money on christening shoes and christening clothes for a baby for only one day, but this is not true. A christening is where the parents and their family introduce their beloved new arrival into the world and it is day full of celebration and joy. To complete the beautiful family portrait, it is imperative that baby looks adorable in his or her christening clothes, and when years later he or she looks back at that first family portrait, he or she will look on with pride and joy at the beautiful picture that was created and a lot of it would have to do with the beautiful baby christening shoes and clothes worn on that momentous occasion.